Out of tumultuous political times facing the United States in the first half of the last century, a vast treasure chest of poetry blossomed, developed by working class poets during the 1920’s through the 1950’s, better known as the PROLETPEN. These poets wrote exclusively in Yiddish depicting working class conditions in the sweatshops, attacks on freedom of expression during the world wars, labor unrest in the nation’s heartland, and the early battles of the civil rights movement. They also wrote about nature, love and more. The passion and vibrancy of their poetry depicted with beauty and fervor created an enthusiastic following unparalleled for American poetry. Their poetry inspired music, art and helped to further the cause for civil rights. Published in Yiddish and English for the first time are poems about Saco and Vanzetti, the Scottsboro Boys, sweatshop conditions, the Spanish-Civil War and much more. 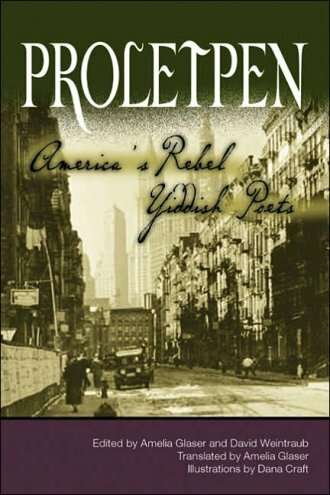 This is a “must have” collection for anyone interested in Yiddish literature, American poetry, U.S. history or a perspective not found in any other anthology that includes Yiddish poetry. This volume begins to put back into Yiddish letters what had been left out for too many years.